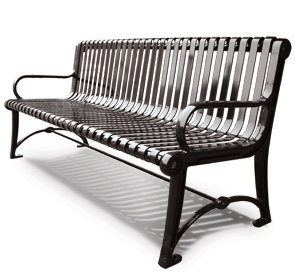 Terraza Style benches combine classically styled cast aluminum leg frames with ribbed steel planks that give the bench a sophisticated look. The Stainless Steel security hardware is tamper resistant, and the bench can be kept portable or mounted to the surface for a more stable installment (anchoring hardware not included). The state of the art finishing process used on the frame combines the application of an 'Electrocoat Zinc Rich Primer' with a durable polyester powder-coat top layer to ensure every crevice and joint is completely sealed, providing full protection against	corrosion and weathering. 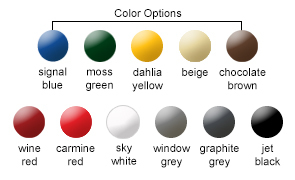 Frames are finished in either a gloss or textured polyester powder-coat finish. 1-5/16" O.D. ILG Steel Tube. 3/16" x 1-1/2" Steel Slats.